Yesterday’s austerity budget can now without doubt be recognised as the most far-reaching and seismic in the history of the state. The December 7th date would seemingly never arrive as the roundabouts and meandering by Government was pale distraction for the fear palpable in the general public. Family and social protection is of primary concern to any individual in this scenario. How one can provide for their loved ones, keep their home, child-care, education, health, career as well as having some sort of social life has well and truly been put under threat from this front bearing of the Government’s four year plan. An allocation of €65.2m for the Arts Council which is a 5% reduction on the 2010 allocation will enable it to maintain its major programmes and activities. The Irish Film Board allocation of €18.4m will enable it to continue to support indigenous Irish audiovisual industry and attract inward investment from international productions. The National Museum allocation of €14.2 million includes €2m capital funding for renovations at the Treasury in the Museum on Kildare Street and the fitting out of the Collections Resource Centre. Almost €21m is allocated to the National Library, IMMA, National Concert Hall, Chester Beatty Library and Crawford Gallery. The artists’ exemption will have a new threshold of €40,000. The section 481 investment tax relief for the film and television production sector will remain in place. An allocation of €9.85m for the National Gallery – a reduction of 3% on 2010. Over €4m is provided to support regional and smaller museums, as well as to fund events such as Culture Night 2011 and the major new contemporary art event Dublin Contemporary 2011. A carry-over of €3m from 2010 will be used towards the funding of Culture Ireland’s major year-long season of contemporary Irish culture – Imagine Ireland– across the United States in 2011. For information on how the Budget will affect Tourism and Sport in Ireland see the press release issued by the Department of Tourism, Culture and Sport here. “Use it or lose it”, the audience who packed into Galway’s Town Hall theatre last night were told, in a discussion with journalist and author Fintan O’Toole. What we have lost as a people and as ascribed by O’Toole is our democracy. We have inherited the feckless and contemptible gambling debts of those who played hard and bet big but ultimately, the house always wins. O’Toole sets out his stall early in the evening: “Before this is a crisis of economy or a social crisis, it is a crisis of democracy”. For over thirteen years a government was charged by the people to guide them to the best of their ability through a period of unprecedented growth, prosperity but also crucially of credit. The staggering ineptitude of the ‘make-or-break’ decisions made on our behalf over the past two years has seen the quicksand creep up around us. The failure of our banks and of financial regulation has been well covered and documented. The people know now what has happened. What we don’t know is, well, where do we go from here? Where is the starting point of change, recovery and ultimately of reform? O’Toole asks the audience, what do you say to a 20, 21, 22 year old graduate when asked “What is there to keep me in Ireland?” The frank answer was reiterated by the audience, that being blank silence. Entire generations have lost connection with their home and their country, a faith so broken it may never be repaired. They have simply been let down. 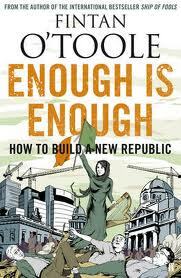 The title of O’Toole’s new book is “Enough is Enough” and this shares the sentiments of all in Galway last night. The evening was not about creating economic treatises or formulas or detailed debate on the ins and outs of the international bond market. 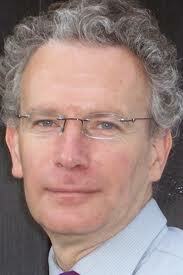 David McWilliams was in the same venue just a night previously for a more focused talk on economics. The discussion was on reform, reform of the failures of past governments, reforms of the attitude of entitlement and reform of the very political system that allowed these failures to occur. O’Toole puts forward five myths within the Irish political system, those being the myths of the Republic, Parliamentary Democracy, Representation, Charity and Wealth. He adds to this five decencies identifiable in the Irish people and which that they should receive indefinitely: Security, Health, Education, Equality and Citizenship. Reforms of these abuses would give power back to the people and continue this process of renewal. Be under no allusions that O’Toole presents himself as a messiah or saviour. Neither he, nor McWilliams or any other person who speaks out to the public would claim to have a quick fix. By coming to Galway last night and by McWilliams touring his Outsiders to all regions of Ireland is to hand back some sense of power to a people long since dispossessed of that security. They speak directly and frankly, and vitally also with a sense of positivity that we can emerge from the coming years somewhat intact. Security has been lost through disengagement with a government which has lost its mandate and which did not act transparently and accountably for the good of all citizens. When we will emerge from this coming period of uncertainty, and emerge we will, reform will have had to be widespread and immediate. This starts with each individual and a night like last night is not a bad place to start. Enough is enough.